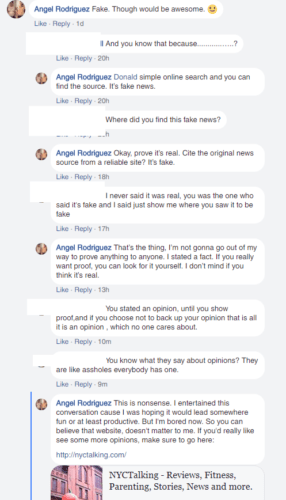 This isn’t the first time that someone got offended when I told them that a website they are religiously sharing stories from is fake. The first time, it was a woman, and she said, “How dare you accuse me of sharing stories from a fake site! Who do you think you are to accuse me of this?” I blocked her right then and there. There were no accusations, simply a stating of fact. Yet, she got offended and was being extremely unreasonable in her response. Well, it’s happened again, but this time this guy threatened me. 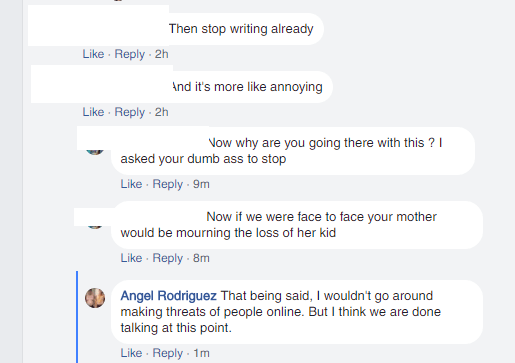 I don’t know him at all, so I saw no point in continuing a dialogue with someone who is threatening my well being. I just blocked him too. Read through this thread for a bit of entertainment, and to see the nonsense I deal with on occasion.